Mrs Phaiboun is a 53 year-old-widow who lives with 6 children at Thamoung village, Khong District, Champasak Province. Before WASHOBA, Mrs. Phaiboun and her family members used to practice open defecation in the garden behind her house and that was not comfortable for herself and children. 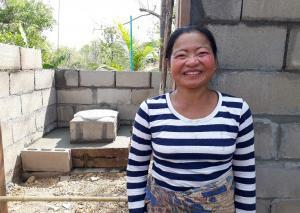 Under WASHOBA, she decided to spend her savings of US$200 to construct a pour flush latrine with the bath room inside. With that, it has now been very convenient for herself and her children. And they do not have open defecation any more.